A friend of a friend classifies certain tasks according to the gender of the person who’s historically-slash-traditionally-slash-stereotypically been responsible for performing the task. ‘That’s a blue job,’ she might call something like drilling holes in walls. ‘That’s a pink job,’ she might label making dinner or doing laundry. For better or worse, I subscribe heavily to the notion of blue jobs: taking out the garbage, assembling furniture, that sort of thing. I’ve been known to say to the professor ‘that’s why I got married’ when he questions why the very full garbage bag is spilling out of the trash can. Seeing as I iron clothing once every three years, it’s highly unlikely I’m going to start draping shirts across my mini IKEA ironing board on a regular basis. The Gort came home from school with a note last week. They were finishing up their science unit on buoyancy and each student needed to bring a boat to school by Tuesday. I filed it under ‘blue job’ and ‘father-son activities’ and went on with my weekend. And then it was Sunday and the professor vanished into a deadline black hole. He went to work at 8.30pm and stayed there for the better part of twenty four hours. 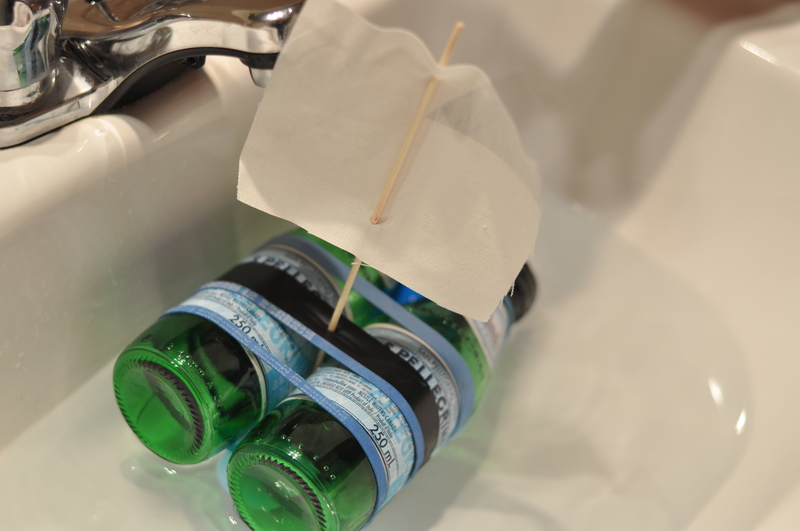 Which means it was Monday night and time for the boys to go to bed and no boat had been made and I reached the unfortunate conclusion that I was going to make a boat before the night was over. So the Gort and I stood in the kitchen and surveyed the cardboard box bearing our recyclable materials. Because the note had specified two things: (1) use recyclable materials and (2) the student should take the lead. Meaning, overbearing, overachieving parents should back off. We had a selection of small, green San Pellegrino bottles, various depleted energy drink containers, a large plastic olive oil bottle, and an empty box of orange juice. ‘We could just rinse this out and put a mast on it,’ he suggested, pointing to the rectangular oil bottle. I considered his bare-bones suggestion….for a nanosecond. ‘I think we can do a little better than that,’ I insisted, my head filled with visions of the Gort arriving at school with the worst boat in grade two history. ‘Well, maybe we could use these two green bottles,’ my oldest relented, warming to the idea of ‘upping’ his game slightly, ‘but we’d need to seal them. I don’t know why you guys always throw the lids away,’ he chided; our roles suddenly reversed. ‘I guess we could tape the ends shut,’ he sighed. I remembered I’d thrown a roll of black electric tape in a suitcase right before we moved. Against all odds I managed to find said roll of tape in less than two minutes. A post-move miracle. I found a couple of wooden disks to cover the openings and we taped over and around until it seemed leakproof. Ish. ‘We’ll have to glue the bottles together,’ the boy instructed-reminded. I surveyed our selection of glue. It seemed highly unlikely that two glass bottles would stick together with the help of Elmer’s Glue or preschool-friendly glue sticks. ‘We don’t have the right kind of glue,’ I concluded, ‘but we could try rubber bands,’ it occurred to me. And I began rummaging through the ‘craft cupboard’ to find the three blue rubber bands I’d seen days before. So he held the bottles together while I carefully wrapped the blue rubber bands around them. With a piece of electrical tape thrown in for good measure. We surveyed our handiwork. It was a bit…..dull. ‘We could add a keel,’ my budding scientist suggested. Having never heard of the word keel, I did my best. We improvised and used a plastic easter egg with a magnet inside. Part keel, part ballast tank? I hadn’t heard that word either until the professor came home and we tested the boat and realized the easter egg had a hole which filled with water rather quickly. A little electrical tape patch, and my blue-pink job was done. The next day, I took out the garbage. Credit to my friend Leo for coming up with the phrase ‘purple job’. You actually ironed the sail? Now that’s commitment. That is an impressive boat! and to find all the supplies a week after moving is a feat too! Go purple! Unnnnnnfortunately, those shirts don’t fit on my miniature ironing board. Darn.